When it’s around two o’clock in the afternoon, and you didn’t get a great sleep the night before, what do you do? I’m guessing you might choose to grab a cup of coffee! I don’t blame you. After all, we all do it from time to time. Caffeine is known—and scientifically proven—to boost alertness, improve attention, and speed up your reaction time and mood. Effective doses of caffeine are in the 30- to 300-mg range, while the average cup of brewed coffee contains between 80 and 100 mg. But is caffeine the best and only way to get your day back on track when you’re hit with a bout of fatigue and fogginess? Not quite. A recent, albeit small study, compared the effects of caffeine and exercise on physical and mental energy levels. 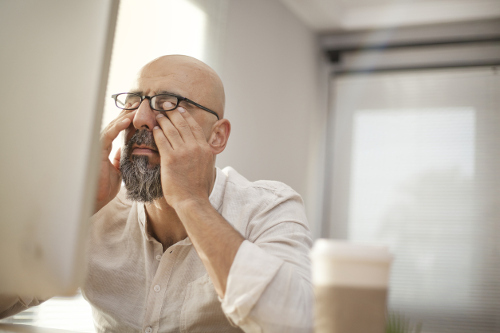 The study looked at chronically sleep-deprived yet otherwise healthy volunteers to compare the effects of caffeine, stair-climbing, and a placebo. The results showed that just 10 minutes on a stair climber improved reported levels of energy more than a 50-mg dose of caffeine. The benefits of exercise are well-researched. Even short bursts of cardiovascular activity can wake you up and enhance mental processing, as well as memory storage and retrieval. Regardless of how tired you are or what type of shape you’re in. Exercise has way more long-term health benefits than drinking coffee each day. Coffee does have many health perks, but it also has a few risks. Some of the long-lasting benefits of physical fitness include better physical and mental function, cognition, and mood and increased patience. And, that’s without mentioning the cardiovascular benefits, like lower blood pressure and a reduced risk of type-2 diabetes and heart disease. So, the next time you’re feeling sluggish in the afternoon or are struggling to stay alert throughout the day and need a quick pick-me-up, don’t automatically reach for the coffee. Instead, head outside for a brisk walk or jog, hit the stairs, take a short bike ride, or, if you’re lucky enough to be near a pool, go for a swim. Doing 10-20 minutes of the exercise of your choice should make you more energetic and alert. The energy-boosting effects of exercise work just as well in the short term as your coffee does, but the long-lasting health benefits are far more valuable! Tello, M., “Exercise versus caffeine: Which is your best ally to fight fatigue?” Harvard Medical School, June 8, 2017; http://www.health.harvard.edu/blog/exercise-versus-caffeine-which-is-your-best-ally-to-fight-fatigue-2017060811843?utm_source=delivra&utm_medium=email&utm_campaign=BF20170612-Energy&utm_id=529798&dlv-ga-memberid=11299132&mid=11299132&ml=529798, last accessed June 13, 2017.